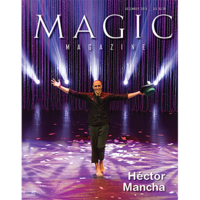 Today, when you order "Magic Magazine December 2015", you'll instantly be emailed a Penguin Magic gift certificate. You can spend it on anything you like at Penguin, just like cash. Just complete your order as normal, and within seconds you'll get an email with your gift certificate. Order in the next 9 hours 11 minutes and it will ship TODAY! He's a Spanish close-up magician who does a pickpocket act. 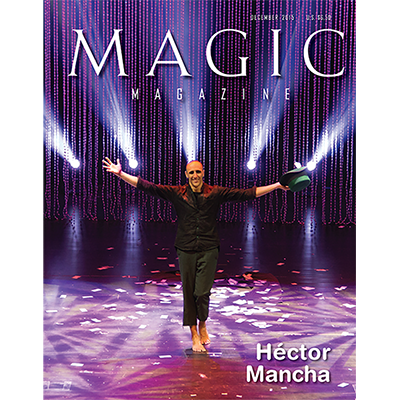 So how did Héctor Mancha win the top prize in Manipulation and the Grand Prix at FISM this year? By inventing new techniques for working with cards and bills. "Comings & Goings" notes on the Hollywood Christmas Parade, an exhibit celebrating Jewish magicians, a Houdini séance, magic at sea, a Bullet Catch documentary, and an animated David Copperfield.